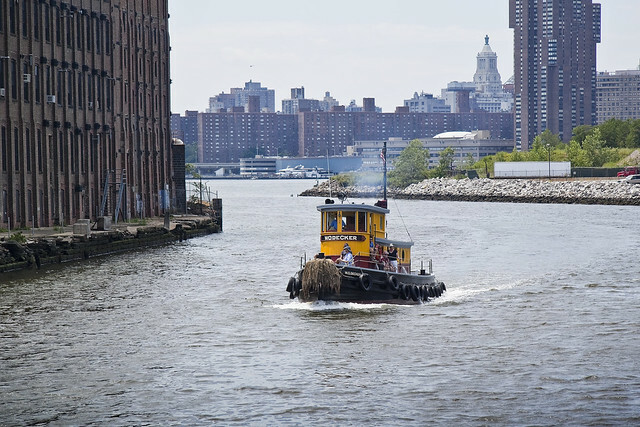 A rare opportunity to ride up the Newtown Creek was recently enjoyed by your humble narrator, and on my journey up that maligned cataract I spotted an artifact of New York Harbor’s glorious past sneaking past Hunters Point. Blue-claw crabs, bluefish, weakfish, striped bass, and other species inhabit the creek, and fishing and crabbing for human consumption occurs [Ref. 7, pp. 2, 5; 8, p. 11; 21, p. 13; 22, pp. 1-2; 24, p. 143; 52, p. 93; 68, p. 3; 69, p. 1]. Subsistence fishing has been observed in Newtown Creek at Dutch Kills, and crabbing for consumption has been observed at the end of Manhattan Avenue in Brooklyn [Ref. 7, p. 5; 21, p. 13; 22, pp. 1-2; 68, p. 3; 69, p. 1]. These locations are both within the zone of contamination for the Newtown Creek site [Figure 2 of this HRS documentation record]. Therefore, Actual Contamination is documented, and the target fishery is evaluated for Actual Human Food Chain Contamination. Wooden hulled, its spitting steam boilers have long been replaced by modern diesel engines, this little (52 feet long) tugboat is the W O Decker. p. 52]. During World War II, the government commandeered factories along the creek to make military equipment, such as a factory that made aluminum for fighter planes [Ref. 11, p. 14]. At that time, Newtown Creek was the busiest industrial port in the Northeast, with tanker traffic lining its length [Ref. 7, p. 1; 11, p. 13]. 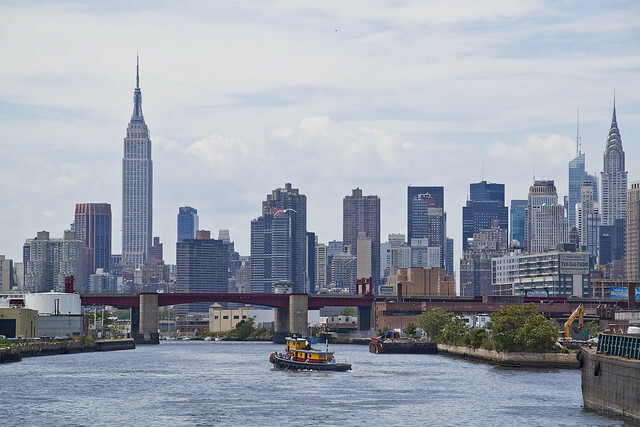 The national highway system built after the war took business away from the nation’s waterways, leading to a rapid decline in the level of industry along Newtown Creek [Ref. 7, pp. 1-2]. A “historic place” the Decker was originally called the Russell 1 when it was built in 1930 for the Newtown Creek Towing Company, who were specialists in berthing and towing heavy cargo along the crowded and narrow waterway. The Greenpoint Manufacturing and Design Center (GMDC) started in the late 1980s as an innovative intersection of two interests: reclaiming derelict factories in North Brooklyn’s Greenpoint neighborhood and sustaining industry and manufacturing in New York City. The organization formally incorporated in 1992. From its initial purchase and redevelopment of a large facility at 1155 Manhattan Avenue for use by light manufacturers and artisans, GMDC has since expanded and today is the only nonprofit industrial developer in New York City. The organization acquires, develops, and manages industrial real estate that provides small and medium-sized manufacturing enterprises with affordable, flexible production space. The Decker is currently a high end tour vessel, operated by and out of the South Street Seaport in Manhattan. The wooden tugboat W.O. 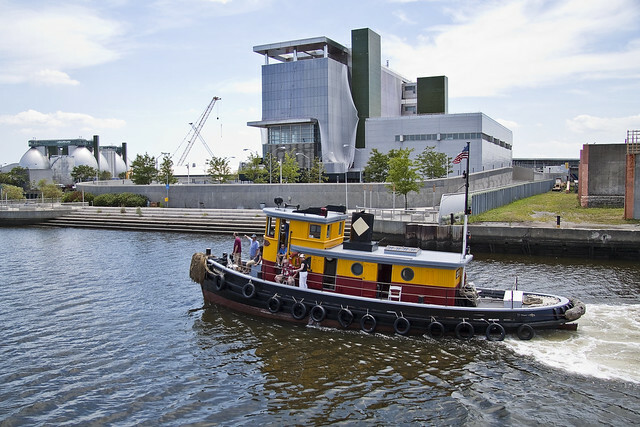 Decker was built in Long Island City, Queens in 1930 for the Newtown Creek Towing Company, a firm specializing in berthing ships and barges in the creek that separates Brooklyn and Queens. Originally called the Russell I for the towing company’s owners, she was renamed the W.O. Decker in 1946 after being sold to the Decker family’s Staten Island tugboat firm. 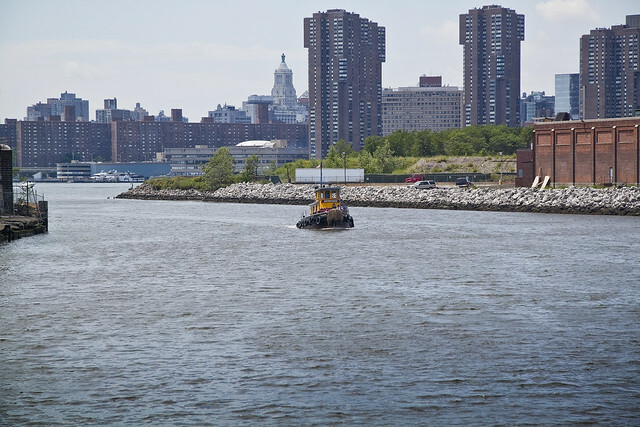 The vessel I was aboard continued on toward the Greenpoint Avenue Bridge, but the Decker turned in the narrow part of the Newtown Creek near the confluence of its tributaries Whale Creek and Dutch Kills. 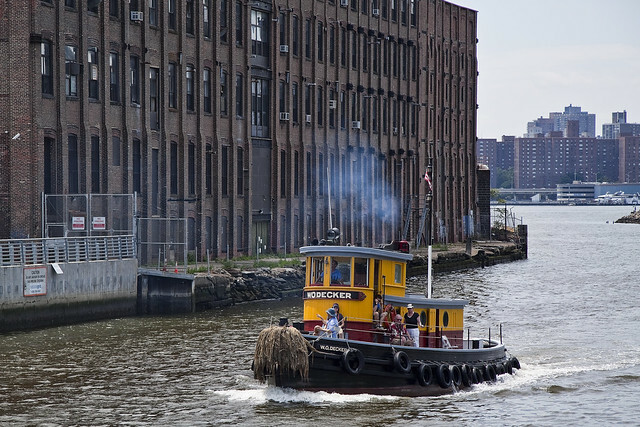 Check out this 1896 article at the NYTimes, which actually interviews the manager of Newtown Creek Towing Company, John Russell, for whom the Decker was originally named.